My contribution, “Punking the Other: On the Performance of Racial and National Identities in Steampunk” had a long journey from grad school paper to publication, and finally seeing this in print has made me reflect about how much has changed since the article was first written, and how much of its commentary has become hauntingly relevant today. The premise of Like Clockwork posits that the traumas of a post-9/11 affected our social and cultural understanding of time, technology, and the individual’s role in the historical narrative. Steampunk is fun and imaginative, but it is also ironic and critical of the past it draws from (and the future it mashes up with). The genre is about humor and pulp storytelling, about fashion and maker culture, about cosplay, satire, and pastiche. “Steampunking” became a cute catchphrase meaning how can one retrofit an object, an idea, or a narrative: a verb to ignite creative re-imagination. But steampunk is also passionate, critical, and serious in its performance. 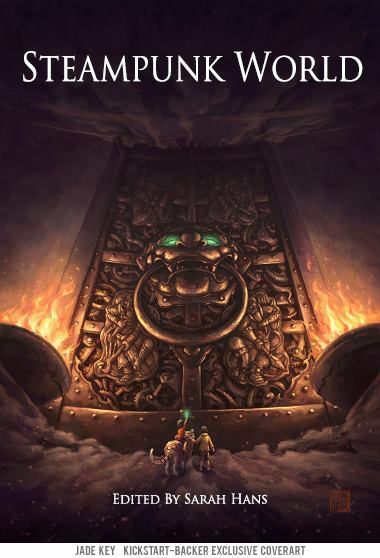 Back then, I was thinking about who was seen as the explorers and who the savages, who had the honor of serving the Queen versus who slaved under Her, who held the power and what did they do with it. It makes for great games of wish-fulfillment and subversion, or wistful explorations of nostalgic superiority. Or a lot of creative works that fall in the gray in-between (good art never asks simple, binary questions). Art can be empowering; it can unintentionally or actively endorse problematic messages; it can be catchy and have great hooks and beautiful aesthetics, and it is never, ever amoral. These were the questions I kept asking when I critiqued the artists and performers I wrote about. The Present — The anthology, written to address a post-9/11 world, now is out in a post-Brexit, pre-Trump world. It is a darker world, one where a whimsical longing for a “historical past that never was” rubs up against slogans about building walls, registering religious minorities, and Making America Great Again. It is a more nationalistic world in a frightening way, where playacting as fascists comes too close to the swastikas and hate speech I see graffitied on the streets of the city I love. Many people did not foresee the stuff of our worst imaginations and in our moral selves being brought to light. Society wanted to sanitize our histories for modern consumption, and in doing so, we forgot how easy it is to repeat history’s mistakes. Are you seen as part of our future nation? Do you deserve the rights and privileges of citizenship? You might, but do they? And what will you do about that? The Future — Over the past few weeks, I’ve overheard and participated in conversations all asking the same question, “What is my duty as an artist now?” More questions: Does my art mean anything anymore? Should I be doing something different with my life? What can I do to protect the most vulnerable, the people I love? I don’t have easy answers to these questions. No one does. But there are many, many acts happening right now that will show what the future holds. Steampunk has typically been seen as a positivist, optimistic genre, under the premise that we still have the opportunity to make things better as long as there are ways we can put dreams into action. To make things into reality. To question our pasts in order to stop terrible futures looming in our present. Because, we must remember that steampunk subculture is performative. It is an action and not a static identity. Steampunk is a verb. Featuring work by: Kathryn Crowther, Perimeter College at Georgia State University; Shaun Duke, University of Florida; Stefania Forlini, University of Calgary (Canada); Lisa Hager, University of Wisconsin–Waukesha; Mike Perschon, MacEwan University in Edmonton, Alberta; Diana M. Pho; David Pike, American University; Catherine Siemann, New Jersey Institute of Technology; Joseph Weakland, Georgia Institute of Technology; Roger Whitson, Washington State University. Last year, I reviewed Joseph Bruchac’s pulse-racing KILLER OF ENEMIES. There is more to this post-apoc steampunk world in the prequel ROSE EAGLE, coming from Tu Books as an original e-novella. In the Black Hills of South Dakota, we are introduced to seventeen-year-old Rose Eagle of the Lakota tribe who is trying to find her place in a world in turmoil after a mysterious Cloud has destroyed all electronic technology. Before the Silver Cloud, the Lakota were forced to work in the Deeps, mining for ore so that the Ones, the overlords, could continue their wars. But when the Cloud came and enveloped Earth, all electronics were shut off. Some miners were trapped in the deepest Deeps and suffocated, but the Lakota were warned to escape, and the upper Deeps became a place of refuge for them in a post-Cloud world. In the midst of this chaos, Rose Eagle’s aunt has a dream: Rose will become a medicine woman, a healer. She sends Rose into the Black Hills on a quest to find healing for their people. Gangly and soft-spoken, Rose is no warrior. She seeks medicine, not danger. Nevertheless, danger finds her, but love and healing soon follow. When Rose Eagle completes her quest, she may return with more than she ever thought she was looking for. The day has come. STEAMPUNK WORLD is now available for pre-order! The top image is the regular cover, and our special Kickstarter supporters will receive a limited-edition version with that epic new cover designed by James Ng. I strongly recommend folks pre-order the books if they are planning to purchase for two reasons. One–it guarantees that you get this awesome book ASAP for your immediate enjoyment. And Two–from a publishing standpoint, books that have strong pre-orders look good in the eyes of distributors and will help keep the book in stock in the long run. Need more convincing? See the official description after the jump. With that seed in mind, I couldn’t help but view A Country of Ghosts as the latest in a long tradition of utopian novels, starting with Thomas More’s as the most well-known early example (and a fantastic open source annotated edition can be read here). Of course, utopias and speculative fiction go hand in hand. In the 19thcentury, Charlotte Perkins Gilman’s Herland envisioned a society of women. Alexander Bogdanov wrote about communist utopia on Mars in his 1908 book Red Star. Later utopian novels include Ursula K. Le Guin’s take on anarchism in The Dispossessed, Arthur C. Clark’s peaceful alien invasion inChildhood’s End, Aldous Huxley’s utopian counterpart to Brave New World in Island, and the fulfillment of the radical movements of the 1960s in Marge Piercy’s Woman on the Edge of Time, along with many others. In A Country of Ghosts a regional collective known as Hron (they’re only kinda, sorta a country) fights against a colonial empire, and Killjoy’s mix of politics and storytelling is at times intellectually engaging and at times winsome, though it’s also a curiosity to behold in the field today. At the age of twenty, Kanze Zenjiro’s bloody footprints mark the bodies of those who stood in his way to protect the throne of Nihon. Now, the tyrannical Iberian Empire is bent on destroying his kingdom, and they send their steam-powered giants and iron spiders against him. Zen, affectionately called the Dragonfly Warrior, embarks on a quest that takes him on the most dangerous journey of his life. 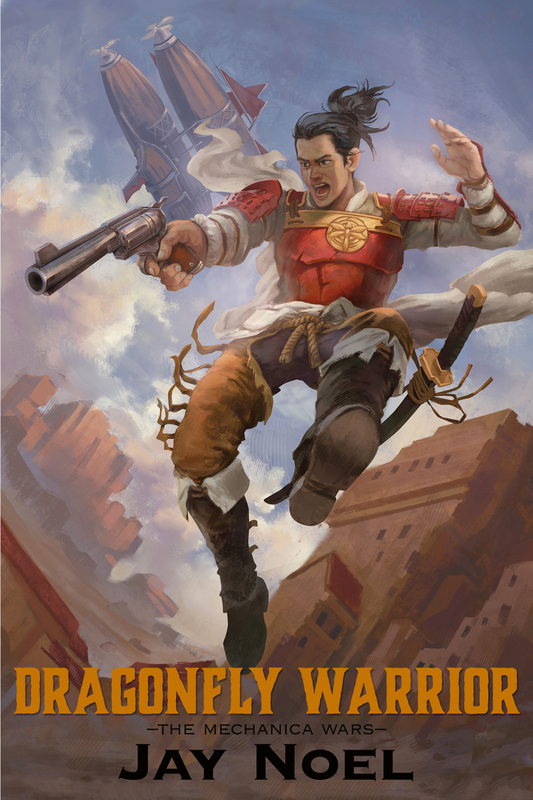 To succeed, Zen must kill all his enemies with only a sword and a pair of six guns and survive a test of faith and loyalty in a world so cruel and merciless, it borders on madness. Beyond Victoriana is happy to present a preview of Jay Noel’s DRAGONFLY WARRIOR. Take a look at the prologue and first chapter after the jump, and interested readers can find more info to purchase his e-book here. 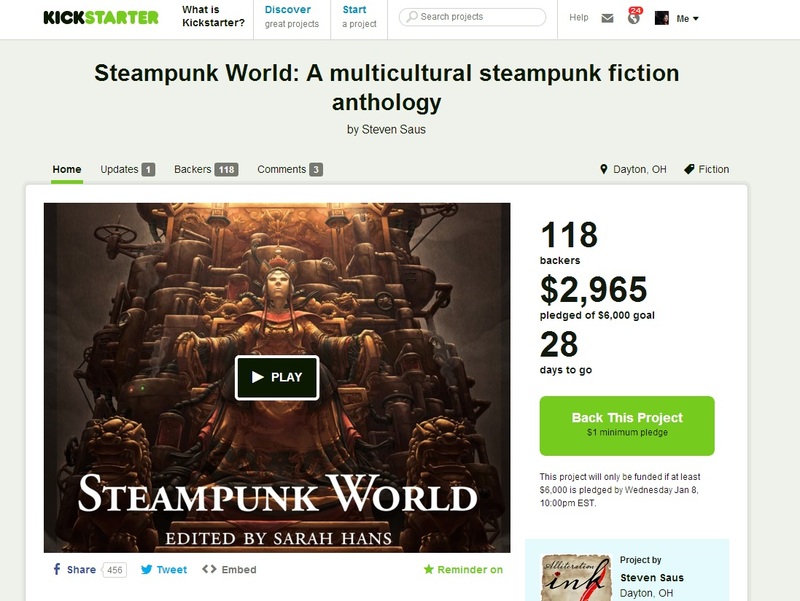 Steampunk World Kickstarter–Multicultural Steampunk Fiction Anthology Goes Live! I was going to post this when it went live, but I’m so excited to report that TWO DAYS after the launch of the Steampunk World Kickstarter, and we’re already halfway to our goal! Thank you to our followers on Facebook, Twitter & Tumblr for getting the word out and donating to this wonderful project. For those who want to read more about the people involves, the prizes, and more crowd-sourcing details, check out the Kickstarter page and boost, boost, boost! Link to Killer of Enemies on Lee and Low’s website. Nowadays, I read so many steampunk-labeled books that very few retain the innovation factor for me. It’s fine to see tropes that establishes the aesthetic as a subgenre, but it takes a lot to make a steampunk book read fresh to me. Then, comes along Killer of Enemies by Joseph Bruchac: a book that’a steampunk by way of Mad Max rather than gaslamp London. Killer of Enemies is not just a gulp of fresh air, but a hyperventilating-inducing adrenaline rush. Oh, and did I mention that this young adult book was initially pitched to me as “post-apoc Apache steampunk?” Yeah, let that catchphrase sink in a bit. Click to order from the French Publisher’s website — International shipping and e-book editions also available! 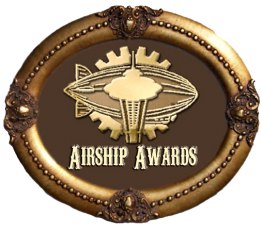 Want to lean more about the French steampunk community? Friend of the blog Arthur Morgan, the owner of French Steampunk, contacted me about the publication of his newest book, which pubs today in France! Gigantic machinery driven by steam, heroes in top hats and monocles, heroines in crinolines holding parasols … The imagery of steampunk has been endlessly fascinating since the creation of the genre in the 1980s. But what are its origins? And what are its key works in literature, film or comic book form? Written by Stephen Barillier, indisputable French expert on the genre, and Arthur Morgan, co-founder of the French Steampunk community and editor in chief of French-steampunk.fr website, this guide provides an inventory of steampunk today, drawing, in particular, on interviews with Tim Powers, K. W. Jeter, James Blaylock, Greg Broadmore or Jess Nevins. 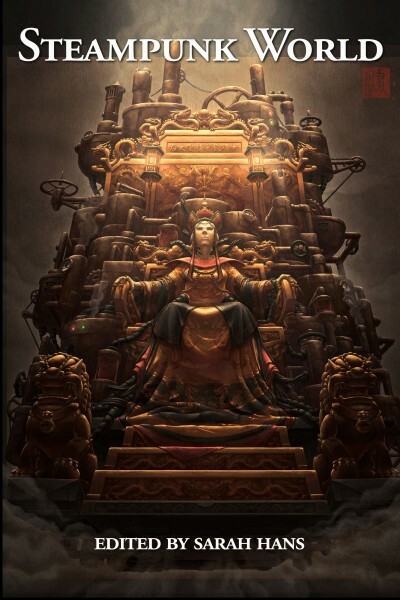 This book is an introductory guide to the steampunk movement. Among the articles on literature, movies, music, comic books, the book gathers interviews of many renown characters of the subculture. Foreword by SJ Chambers. Featuring interviews from Ann Vandermeer, James P. Blaylock, KW Jeter, Tim Powers, Greg Broadmore, Jess Nevins, Mark Hodder, George Mann, Captain Brown of Abney Park, Mike Perschon and artists from the French steampunk community. Des machines gigantesques mues par la vapeur, des héros en hauts-de-forme et monocles, des héroïnes en crinolines et ombrelles… L’imagerie du steampunk ne cesse de fasciner depuis la création du genre dans les années 1980. Mais, quelles en sont les origines ? Et quelles sont les oeuvres majeures en littérature, au cinéma ou en bande dessinée ? Rédigé par Étienne Barillier, spécialiste incontournable du genre, et Arthur Morgan, cofondateur de la communauté French Steampunk, ce guide dresse un état des lieux du steampunk aujourd’hui autour, notamment, de rencontres avec Tim Powers, K. W. Jeter, James Blaylock, Greg Broadmore ou Mathieu Gaborit. Recently, everyone and their grandmother are trying to place steampunk in the grander scope of things. Most of pop culture has poked at it at this point. Many in the SF/F community gives the subculture a passing nod (or are slowly edging away, since, being early adapters by nature, quite a few in sci-fi are tired of it already). Still, questions about steampunk have set people in pursuit of the deeper meanings behind the aesthetic movement. Two years ago, Intel’s futurist Brian David Johnson wanted to answer the biggest one about steampunk’s rise: “Why now?” He was joined by a cultural historian James Carrott and they filmed a documentary, which permutated into a book by the same name: Vintage Tomorrows (or two books, actually. Steampunking Our Future: An Embedded Historian’s Notebook is the free e-book companion you can get online). I had the pleasure of meeting them at NYCC a couple of years ago to hear their idea first-hand: steampunk has the potential to be a counterculture. I’m actually on the fence about this (surprised, right?). Because, as much as I love the subculture, radical change isn’t a given to participate. Lo and behold, however, when a copy handed on my desk awhile back, I gave their research a gander.